For much of the 18th and 19th centuries the roads in America were, well…dirt. Often mud. And bridges, well, they just didn’t much exist. That made transportation difficult at best. So businesses moved their goods by boat along canals and rivers. While there were paddle wheelers on the Mississippi, along the eastern seaboard steamboats were the preferred mode of transport. In 1908, one particular steamboat was launched in Maine named Tourist, which was later sold and renamed Sabino. Today, the Sabino, the last wooden coal-fired steamboat in regular operation in America, is a National Historic Landmark that regularly takes passengers out from Mystic Seaport. 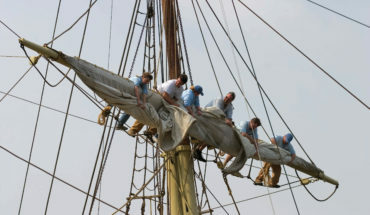 She has seen a century of activity, including sinking, being raised and subsequently running for more than 30 years along the coast of Maine. 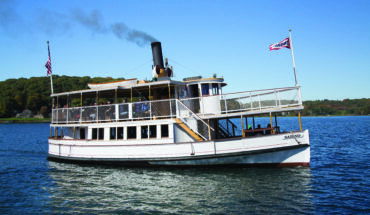 Since 1974 she has been a fixture on the Mystic River, where she offers passengers a unique cruising experience—all under the power of her original two-cylinder compound steam engine. After a comprehensive restoration in our shipyard, she returns to operation this July. 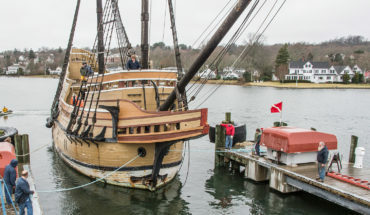 For an up-close look at this American icon, head down to her home at Mystic Seaport.